Over the weekend I made our family’s favorite, Cucumber-Tomato Salad, also known as Cucumber-Melon as we’ve called it for years! My Tia Rocky would always bring this to all our family gatherings, this was her designated dish she always brought and we all loved-loved-loved it! Last week when I went grocery shopping I noticed cucumbers were on sale and the first thing that came to mind was, cucumber-tomato salad! 1. Start by washing both the cucumbers and tomatoes. 2. Slice the cucumber in half and scoop out the seeds. Chop the ends off and cut the rest of the cucumber to desired size. 3. Slice the top of the tomato off and then cut in half. Scoop out all of the insides of the tomato and then chop to desired size. 4. 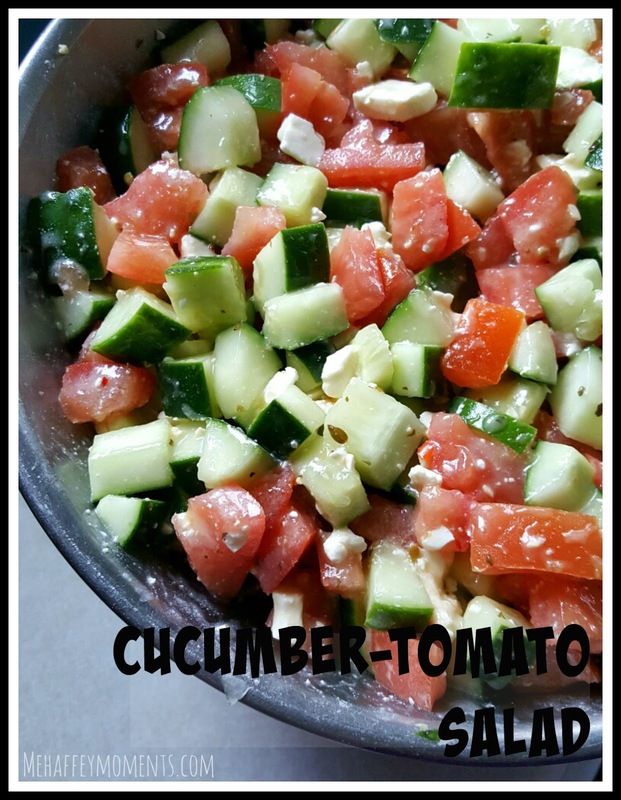 Add all the chopped cucumber and tomato to a large bowl. Sprinkle the crumbled feta cheese on top and pour 3/4 of the bottle of Italian dressing over top. 5. Stir all the ingredients together and refrigerate for at least an hour. We like to serve ours with tortilla chips.